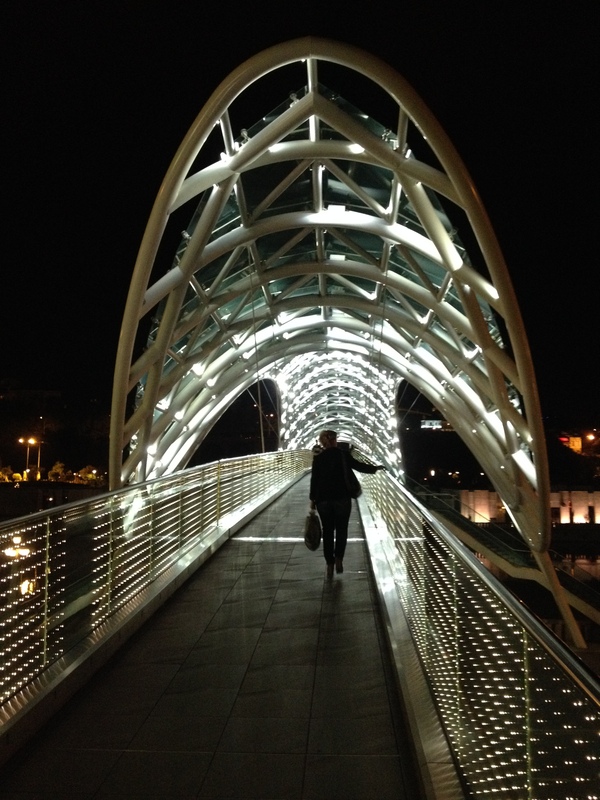 At the beginning of last October, I arrived in Tbilisi for a month-long culinary sojourn across Georgia. I owe an enormous debt of gratitude to the many people who made that trip such a memorable and valuable experience. I’ve written about several of them on this blog already, but I let the chronicle fall by the wayside as the flow of life rushed on. I’m picking it back up with this post, one year later. It seems appropriate, actually, to be writing about these autumn experiences as the season returns. As I type, woodstoves are being lit, persimmons and quince are being plucked from their branches, and grapes are fermenting into machari (slightly alcoholic fizzy grape juice), and then into wine. May that spirit of coming together to create warmth, enjoy the fruits of past labor, and put in the work required to create something new imbue your month as well, wherever you may be. I left off in Kakheti, Georgia’s easternmost region and the one where the majority of its grapes are grown. My friends Wendy and Erin have come to spend a week traveling with me. 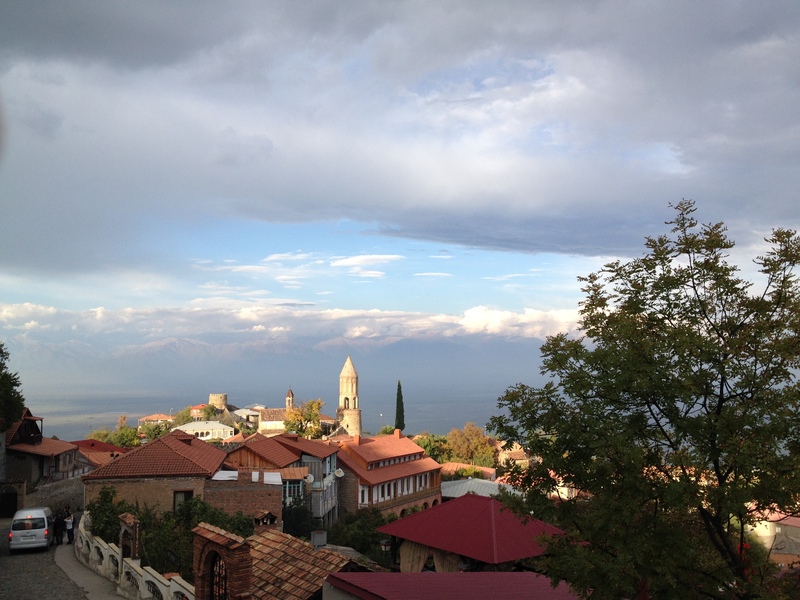 We’re in Sighnaghi, a small town that underwent significant renovation within the past 10 years on a Georgian government-sponsored initiative to turn it into a tourist magnet. While the facades do at times feel superficial, the plan worked: thousands of people now visit the town every year. 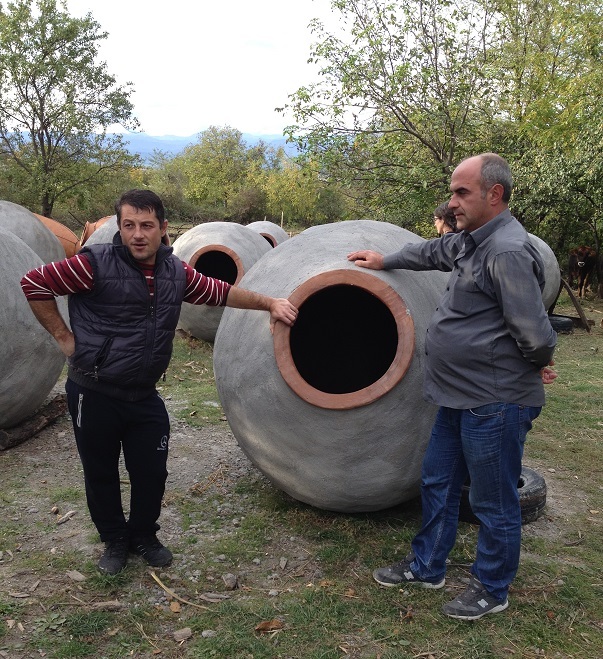 One of the major draws of the town is Pheasant’s Tears, the product of a partnership between Georgian winemaker Gela Patalishvili and American artist (and shrewd businessman) John Wurdeman. 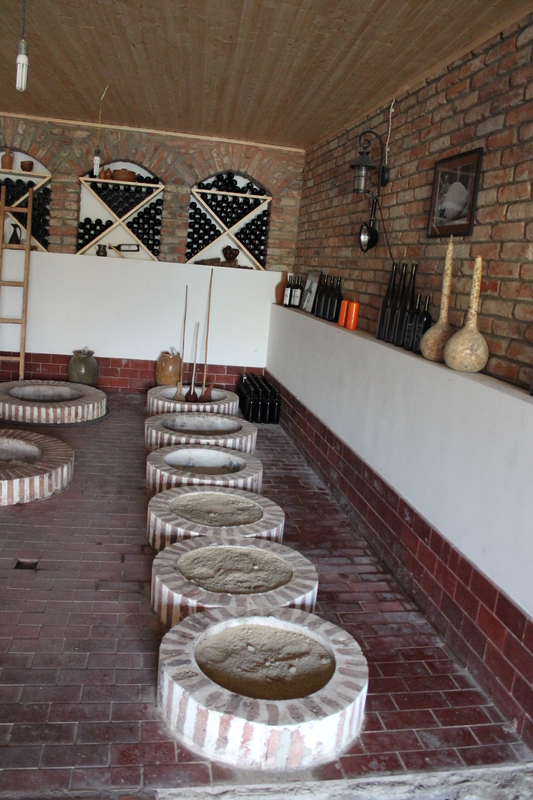 I first visited Pheasant’s Tears in 2010, on a weekend mission to pick grapes and learn how qvevri wines are made while I was teaching English in Batumi. The restaurant and tasting room that were under construction at that time have since opened, and I wanted to come back to see how they’d turned out. Before sitting down to dinner, we got a brief cooking demonstration from chef Gia Rokashvili, himself a Sighnaghi native whose kitchen is turning out some of the most enticing and creative food I’ve encountered in Georgia. He’s a calm, round man with a glimmer in his eye who sang to his vegetables as he pieced them together on the plate, as if they were his tiny children. Gia’s love of fresh produce shows through in his dishes, which showcase fruits and vegetables from the kitchen’s garden in simple yet unexpected ways, like a salad combining blanched spinach, caramelized onion, fresh dill and watercress, and scallions with white beans and a dollop of water buffalo yogurt. 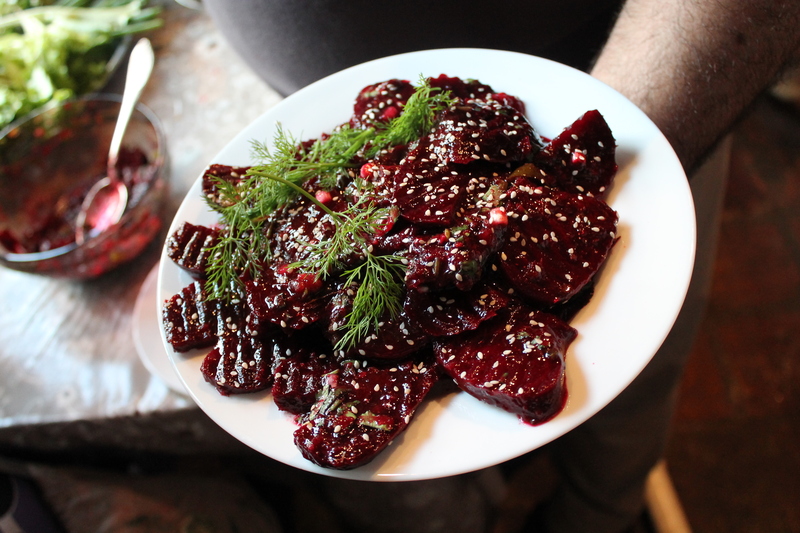 His cooking is solidly grounded in tradition but manages to surprise with subtle additions and twists that set it apart from more typical fare, like a beet salad marrying roasted, cooled beets with blue fenugreek, coriander, summer savory, garlic, cilantro, and tkemali (a tart plum sauce), garnished with dill. The flavors are all inherently Georgian, and if the beets and herbs were pureed, this would be traditional pkhali, yet there is that smoky fruit tang lingering in the background. Dinner involved a series of dishes brought out in succession at pace with six different wines, starting with the lightest (a delicate chinuri) and proceeding to the darkest (a rich saperavi, a red grape so dark its name literally means “dye”). All the wines at Pheasant’s Tears are fermented in qvevri, but not all are fermented along with the grape skins and stems. We tasted two versions of a wine made with the rare red tavkveri grape, one with “skin contact,” one without. The grape skins lend color and tannins to the wine, so whether a vintner chooses to ferment the wine on the skins or not (and for how long the skins remain in the qvevri) profoundly affects its flavor and the way it feels in your mouth. 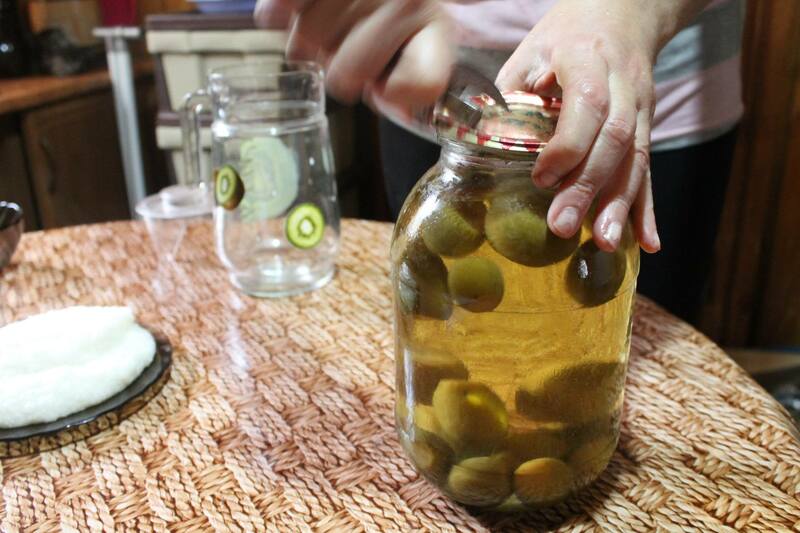 The tavkveri fermented without the skins tasted light, easy-drinking, a little sweet. Skin contact turned it into a chewy, earthy, complex wine crying out for something animal. The kitchen delivered: out came Gia’s take on kuchmachi, small pieces of chicken liver and ground walnuts tossed in a piquant pomegranate sauce. It’s very easy to overcook liver, which results in tough and unappetizing chunks of iron-flavored flesh. Thankfully, whoever cooked ours hit the sweet spot where the outside of each piece turns crisp and brown while the inside stays soft and creamy. We finished off the meal with a shot of chacha (Georgian grappa) aged in oak, which turns it a dark amber color and helps smooth off any rough edges. We ambled back to the van where our trusty (and sober) driver Beso awaited, stuffed and drunk and sleepy and content, a feeling I was getting increasingly accustomed to after just two weeks of travel. Leaving the rocky moors of Samtskhe-Javakheti behind, Wendy, Erin, and I traveled up through the central Kartli region near Tbilisi and into the rolling hills of Kakheti, Georgia’s wine country in the east. If you’re reading this blog, you might already know that Georgia boasts one of the world’s oldest wine-making traditions: people have been fermenting grapes into wine here for nearly 8,000 years. The country is home to 525 (!) native grape varietals that most of us in the US have never heard of. They’ve got colorful names like usakhelouri, “the nameless,” and kindzmarauli, “cilantro vinegar” (which must have been a ruse to deter someone from stealing the grapes, because these grapes produce a delicious blood-red semi-sweet wine that tastes nothing like either of its namesakes). During the Soviet period, Georgia supplied most of the wine for the entire USSR, and quantity took precedence over quality. Today, things are changing. 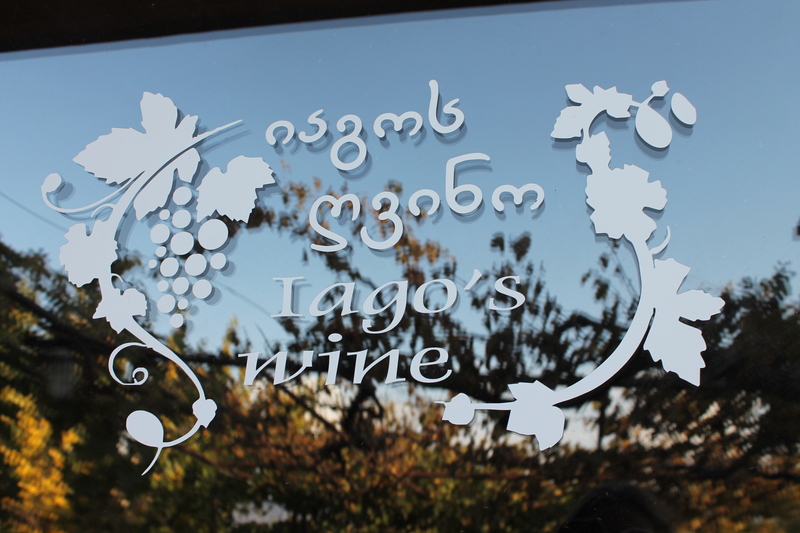 When Russia placed an embargo on the importation of Georgian wine in 2006, Georgia’s winemakers had to reorient their production for other markets. (Until then, Russia had been purchasing approximately 80% of all the wine Georgia exported.) Wineries revamped their standards to make their wines eligible for sale in Europe, and an increasing number of small producers saw the potential for marketing natural wines fermented in the classic Georgian style, which differs in a few key ways from the wines most Americans and Europeans are used to drinking. 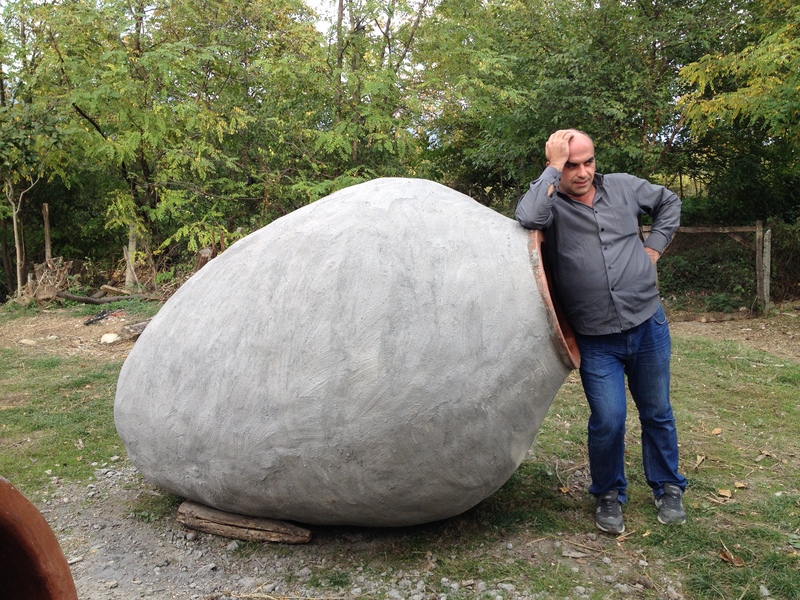 Our driver Beso takes a break next to a full-size kvevri in Kakheti. 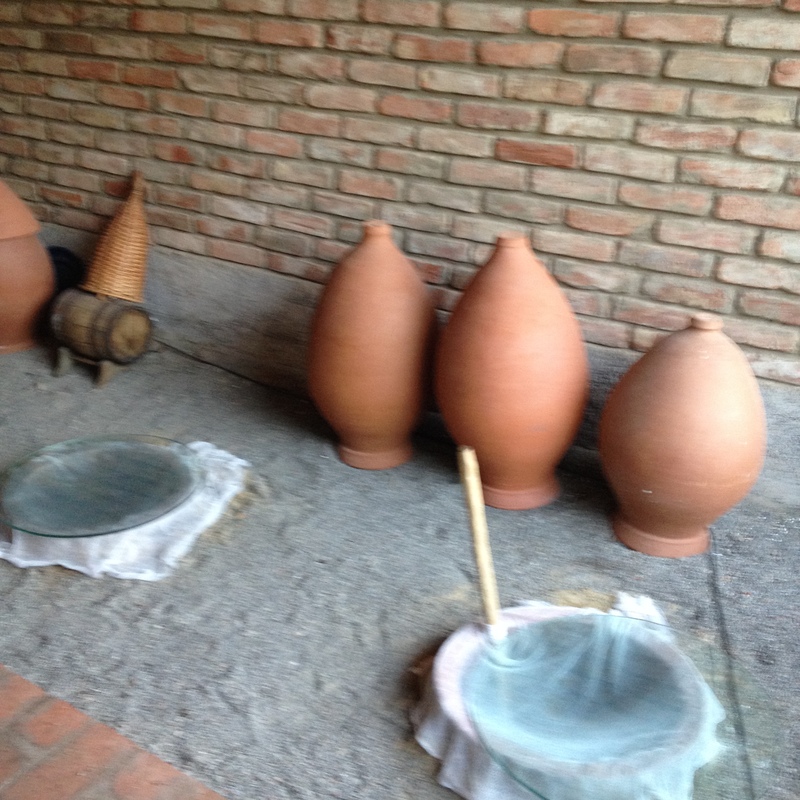 First of all, Georgian wines are traditionally fermented in huge terracotta vessels called kvevris rather than in oak barrels or stainless steel tanks. The kvevri is coated with lime outside and lined with beeswax inside to seal the clay, then buried underground where the temperature remains constant. Winemakers who produce “natural wines” don’t spray their grapes with pesticides, rely on the “ambient” yeast present on the grape skins and in the air to generate fermentation rather than adding cultured yeasts, and typically do not add sulfites (which are used as a preservative in most Western wines). In Georgia, white grapes have traditionally been fermented along with their skins, seeds, and stems (the “pomace”) just like red grapes, whereas European and American vintners ferment white grape juice all by itself. 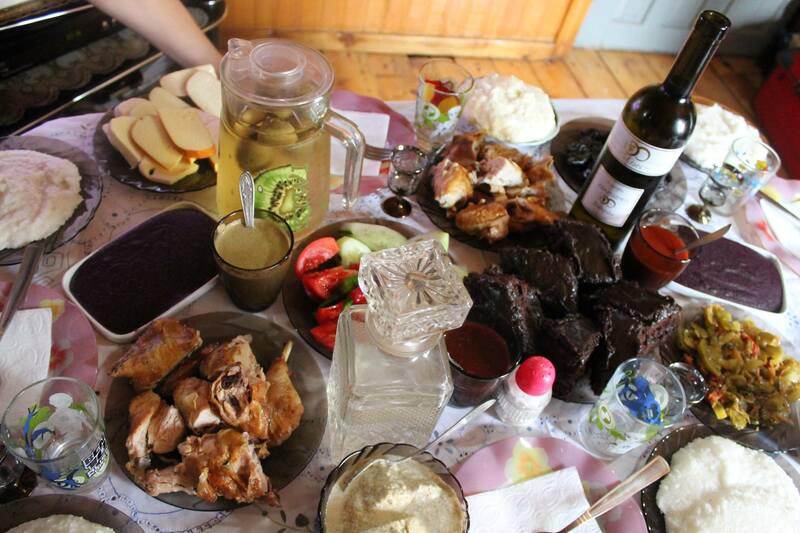 This practice gives some Georgian whites an amber or orange color (from the skin contact) and a tannic, highly savory quality, which allows them to stand up to the bolder flavors most of us would typically pair with red wine, like grilled meat. 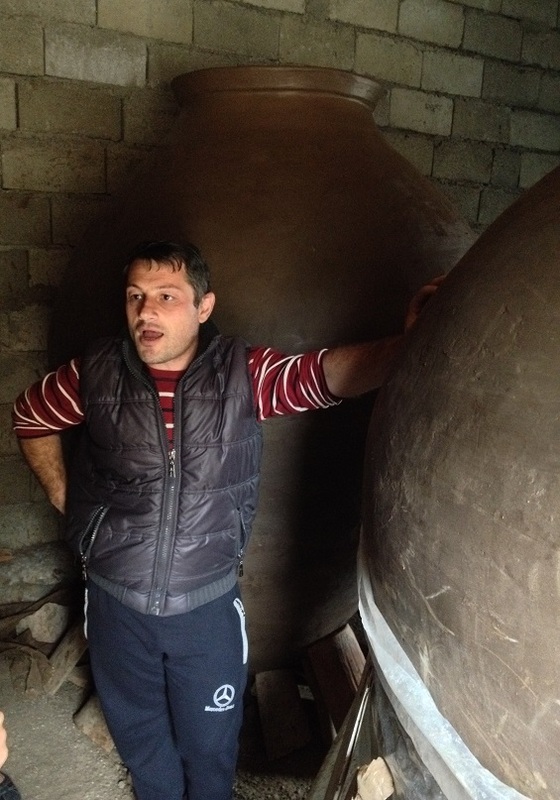 Iago Bitarishvili is one of the vintners making internationally renowned kvevri wine in Georgia today. Wendy and I had tasted his delicate 2010 chinuri (which takes its name from a native Georgian white grape) at Oda House in New York a couple of years ago and were thrilled to have the chance to visit his marani (the Georgian term for a place where wine Is made) in Chardakhi, a village about 30 kilometers outside Tbilisi. The grapes are picked but not pressed and poured into the kvevris just as they are. Six of Iago’s kvevris are 300 years old! With a product that lasts for centuries, it’s no wonder that kvevri makers are so few and far between. The kvevris are covered loosely with tarps or mesh, so as to keep bugs and dust from getting in while allowing the gases produced during fermentation to escape. The kvevri is covered with mesh during the first stage of fermentation to keep bugs out and let Co2 escape. The kvevris in the background are decorative and not representative of the size of those buried. Within a few days, the grapes are crushed under their own weight and their juice (the “must”) begins to bubble: this signals the release of carbon dioxide as the grapes’ natural sugars are converted into alcohol. The grapes must be punched down and stirred a few times each day as this first stage of fermentation proceeds. Families who make their own wine at home often start drinking the immature wine (called machari) at this stage, when it tastes fizzy and tangy-sweet. After about 2-3 weeks, when the bubbling dies down, the must is filtered off the lees (the stems and seeds that have sunk to the bottom of the cone-shaped kvevri) and poured into another kvevri, where it is left to age for another 5-8 months under a tightly sealed cap. 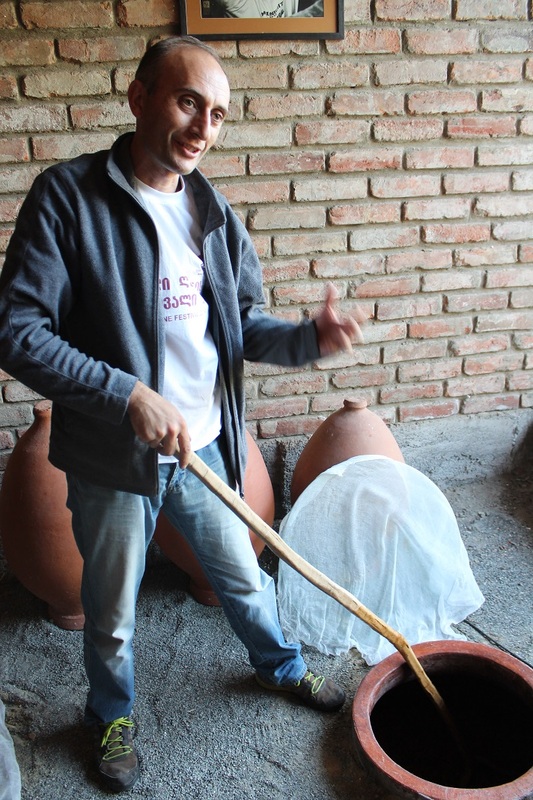 Many winemakers, including Iago, continue to ferment the lees into chacha, or Georgian grappa. Finally comes bottling and labeling, both of which Iago does himself on-site. He produces only about 3,000 bottles a year, which he is now exporting to eight countries. After our tour, we get a lesson in folding khinkali dumplings from Iago’s wife, herself a rare female winemaker, then sat down to eat them along with the other Georgian stand-bys of khachapuri, cucumber and tomato salad, eggplants with walnut sauce, and, of course, plenty of wine. The next day, Erin and Wendy and I meet Makvala Aspanidze and her sister Donari in a village near Aspindza, where Makvala lives in a ramshackle old house with her elderly mother and her nephew. 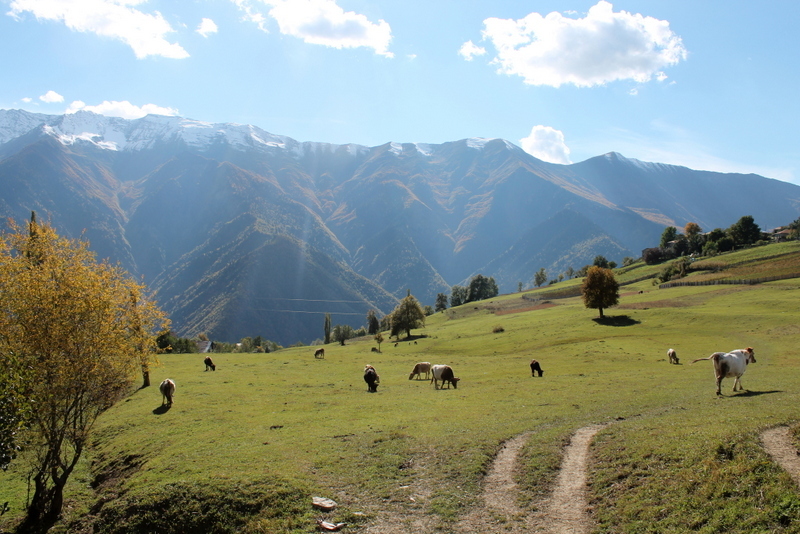 The Aspanidzes and others native to this area of south-central Georgia call themselves Meskhi, or Meskhetians (hence the first part of the name of this region, Samtskhe-Javakheti). 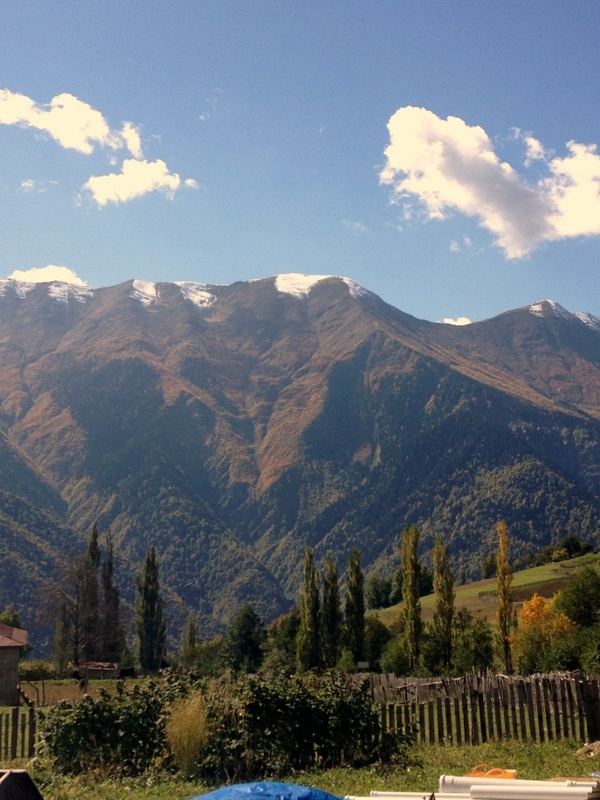 This area is one of the poorest in Georgia: 60% of the population lives below the poverty line and 80% are either subsistence farmers or unemployed. 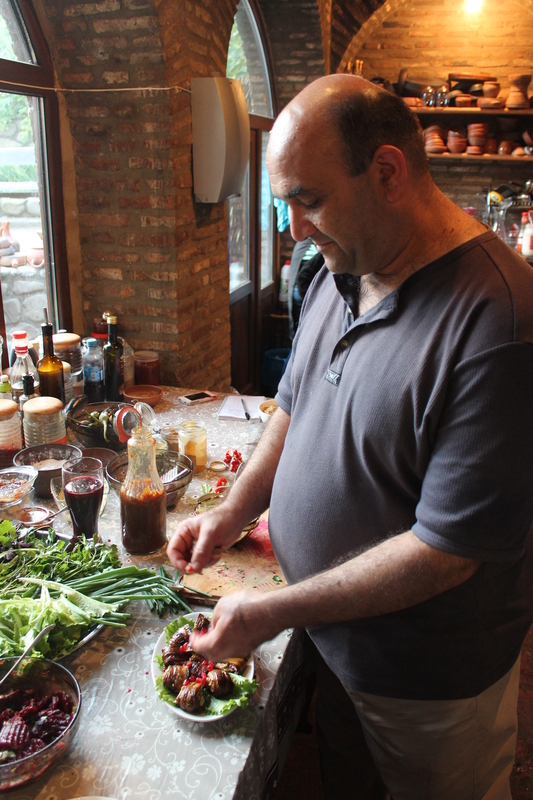 Makvala and Donari have agreed to give us a master class in Meskhetian cooking. They take care to don plastic hair nets and aprons before starting to cook, which is a considerate nod to American-style kitchen sanitation standards but makes me smile for its peculiarity in this context—we’re cooking in a structure with stone walls, a corrugated metal roof and peeling wallpaper. There is no sink and no soap in the kitchen–water is drawn from a well outside. Makvala’s mother is convalescing in the next room, where Makvala asks us to toss our coats and purses. Our Georgian guide Sofia and driver Beso seem more concerned about the shabby appearance of things than Wendy and Erin and I are. Beso spends the rest of the trip incredulous that someone would parade a gaggle of American tourists past their ailing mother–to him it seems the epitome of rural bumpkin-ness. Yet this is how they live, and I’d rather see that than have it whitewashed. Still, I hope our tour company is compensating them well for their food, knowledge, and time, all of which they gave generously. We’re having dessert before dinner today: Makvala brings out homemade cornelian cherry liqueur and a pan of honey cake (my favorite!). It tastes like someone slathered whipped cream between layers of graham crackers like a dessert lasagna, then poured more cream over them until the layers softened and melted into one another—in other words, heaven. 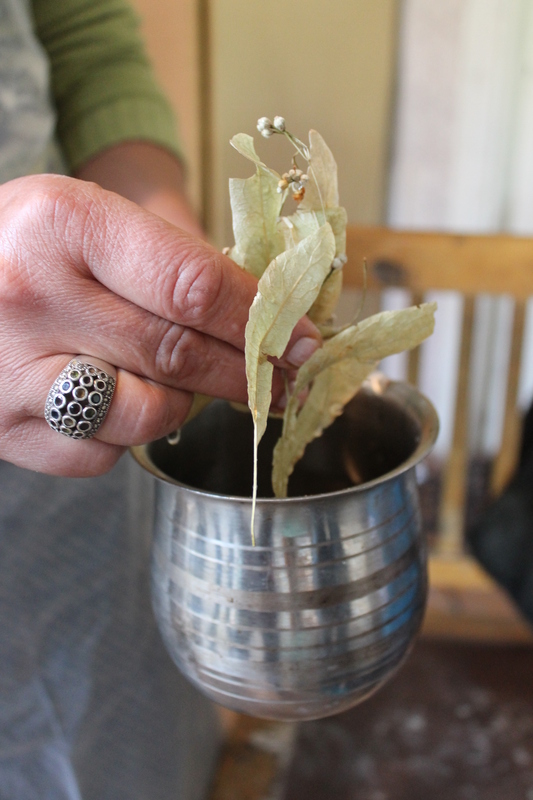 Next is gently sweet tea made with leaves from their linden tree. (Lindens are closely related to the North American dogwood.) Now that we’re full and happy, the cooking can begin! Unlike most of the foods I’d encountered on the trip thus far, I’ve never so much as heard of most of the dishes they are about to show us how to prepare, which is exciting for me. First up is qaisapa, a sweet-savory “soup” made from dried apricots, a type of plum native to this area called chonchuri (also dried), plum jam, sautéed onions, and clarified butter. While the dried fruits are softening in hot water on the stove, Donari starts in on the obligatory khachapuri. 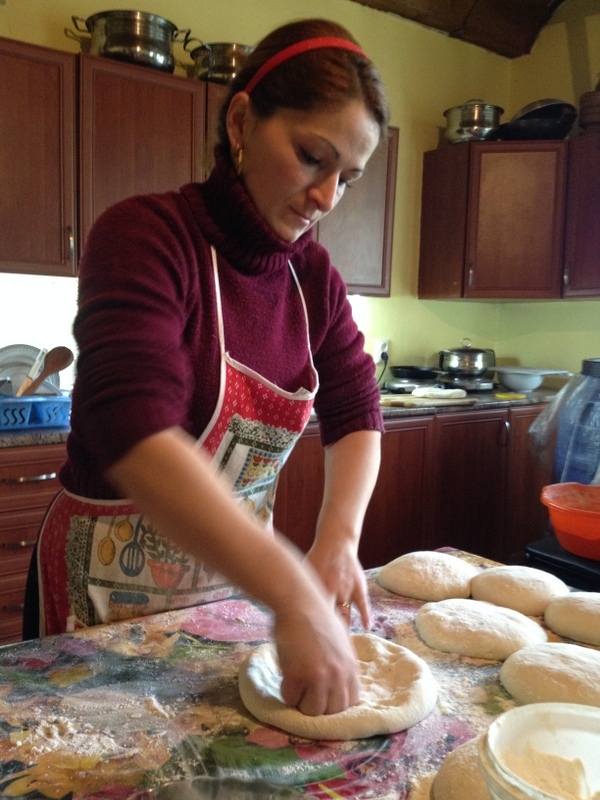 She’s making penovani khachapuri today, which requires making her own puff pastry. She doesn’t put any yeast into her dough—just flour, water, and salt—and says the dough should be firm, which promotes the formation of flaky layers. She forms softball-sized balls, lets them rest for a few minutes, then begins to stretch each one into a sheet the size of a small tablecloth. She doesn’t have to do much work—the dough stretches neatly under its own weight as she lifts and turns it—but controlling the speed of the turn to make sure the dough stretches evenly turns out to be harder than it looks. (She bravely let us each try our hand at it.) 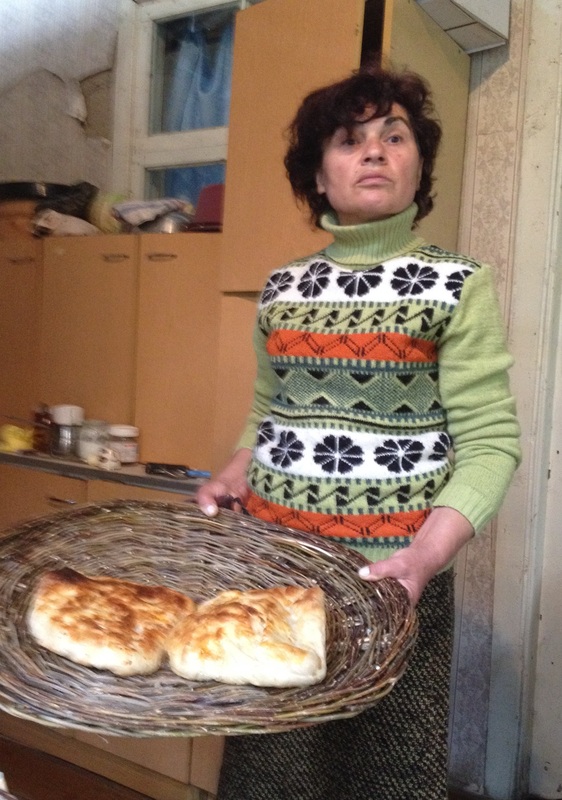 Whereas Arleta in Samegrelo had spread the layers of her penovani khachapuri with margarine, Donari uses lard in hers, which gives the khachapuri an addictive porky note. The pastry’s paper-thin, crisp crust shatters when I bite into it, and the layers of rich dough pull apart to reveal a center oozing with salty cheese. Then comes tutmaji, another local specialty, this one a dough and yogurt soup that’s said to work wonders on hangovers. “The men always ask for this one,” says Makvala knowingly. Basically, it consists of little dough worms and lumps of egg, salt, and flour all fried in clarified butter (which has a very particular, pungent aroma to it here, likely due to whatever forage the cows are eating), then boiled in salted water, with a few cups of yogurt added at the end. It’s not my favorite. Donari is now rolling out a softer, yeasted dough (which she prepared before we arrived) to make bishi and bushtulebi, essentially two different forms of fry bread. Bishi are flat discs about 6 inches in diameter, while bushtulebi look like golf balls. Donari fries them in sunflower oil (which is ubiquitous in Georgia) until they are golden and crisp on the outside, satisfyingly chewy on the inside. These are unsweetened, but Donari suggests drizzling honey over them if we like. Our stomachs are so full of dough by now that we can only muster a few. As throughout Georgia, running out of steam before the food is gone is expected here—if there isn’t too much to eat, there’s not enough. My friends Erin and Wendy joined me in Georgia in mid-October for nine days of travel, adventure, and more food than most people consume in a month. 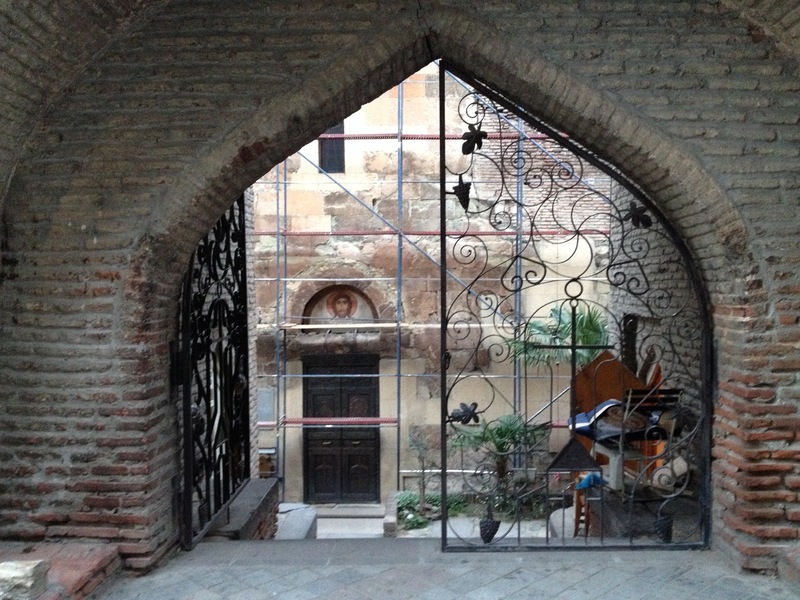 After a quick two-day sojourn to Yerevan, Armenia (which I found less charming than Tbilisi but with a more varied and colorful fresh food market), we passed back into south Georgia and met our guide for the next week, Sofia. The local people devised all sorts of ways to protect themselves, including hollowing out more than 400 rooms spanning 13 stories inside of a cliff. I can only imagine how painstaking and exhausting this work must have been. Yet they continued to chisel away for some 50 years. 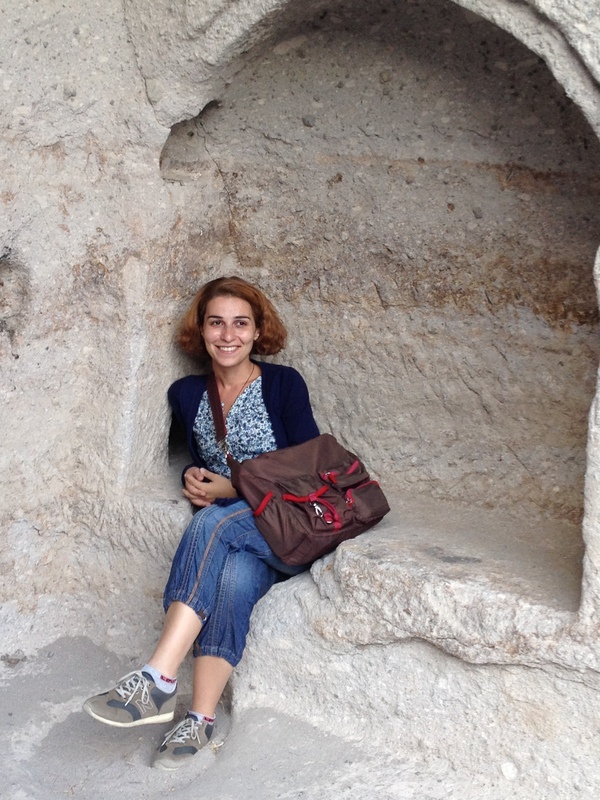 At its height, 50,000 people called the Vardzia cave complex home. 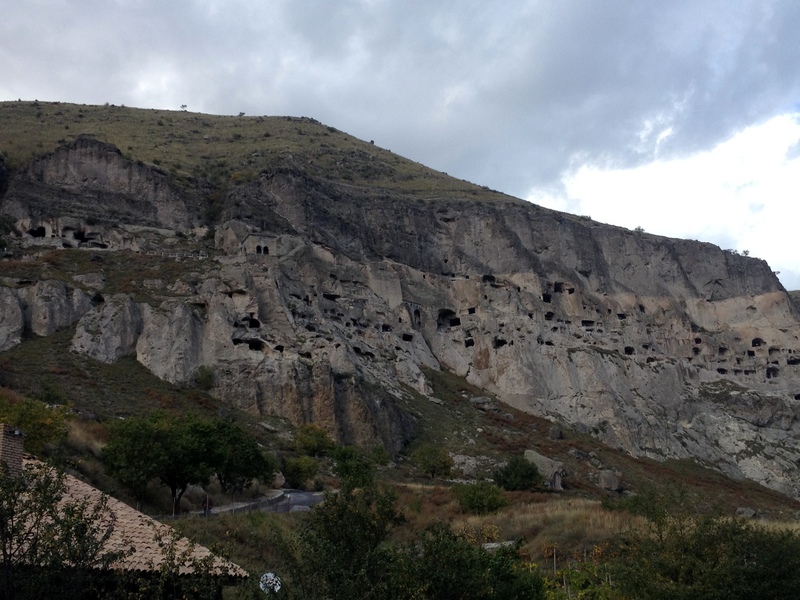 Alas, an earthquake in 1283 shook loose the outer wall of the cliff into which these caves were built, revealing them to the valley below like a natural dollhouse. Today the site draws tourists like us but is also a working monastery, where a handful of monks still live among the caves and tend the small church hollowed out of the rock. After an al fresco lunch (including potatoes, yes, and whole smoked trout), we headed up the cliff to scamper among the caves ourselves. 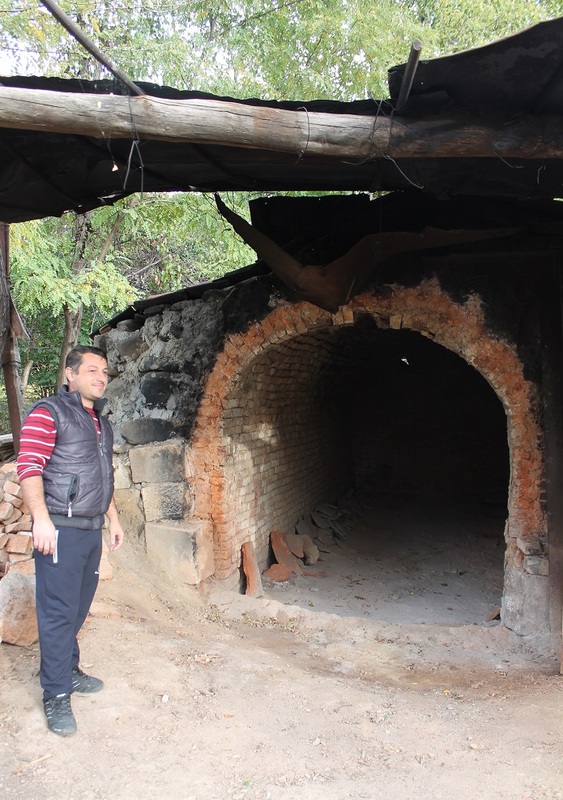 Sofia pointed out depressions in the floor of certain rooms that would have served as ovens for baking bread, and hollows in others where they would have buried the qvevris (clay amphora) in which they fermented wine. The beds, I’ll admit, didn’t look very comfortable, but the view? Stunning. 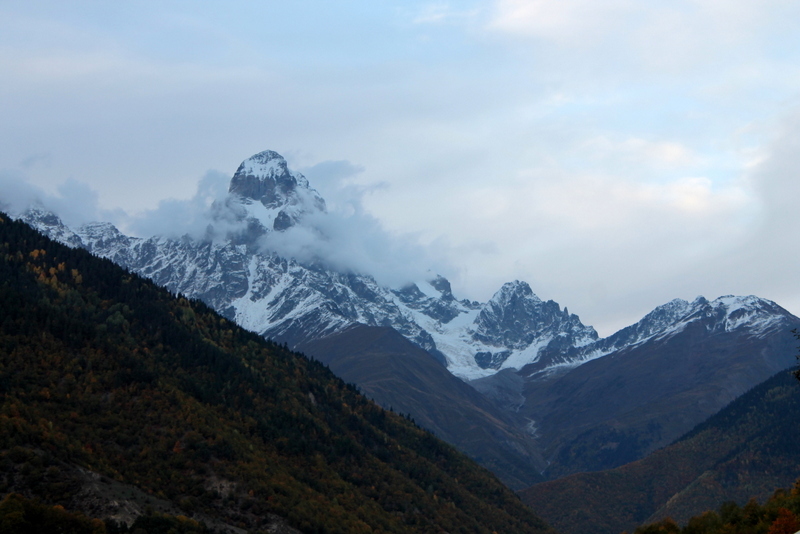 After a few days in Tbilisi gathering contacts and getting ideas, I set off for my first homestay, in the western Georgian region of Samegrelo. Samegrelo is the home of the Megrelian people, most of whom speak both Georgian and Megrelian, one of the few languages in the world that is related to Georgian. To me, Megrelian sounds to Georgian as Portuguese sounds to Spanish—a little softer and swingier, with rounded corners. The region is also known for its spicy food. 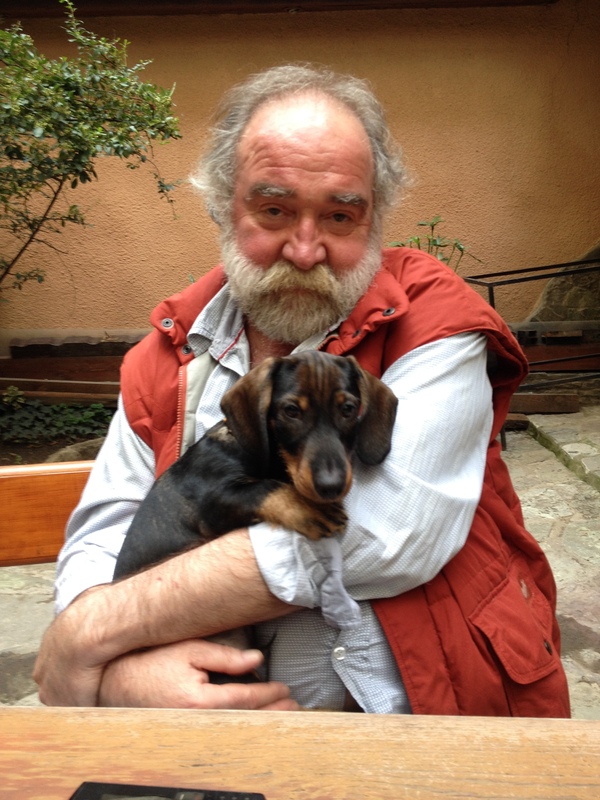 When I asked Oleg (the man with the puppy from my last post, who used to host a travel documentary-style TV show about Georgia) why these people eat spicier food than the rest of the country, he said, “Simple: malaria.” He told me that this area of Georgia is swampy and was once a breeding ground for malarial mosquitos. People who ate loads of hot peppers seemed better-shielded against the blood-sucking buggers, so chilis appear in everything from soups and salads to meat and egg dishes here. 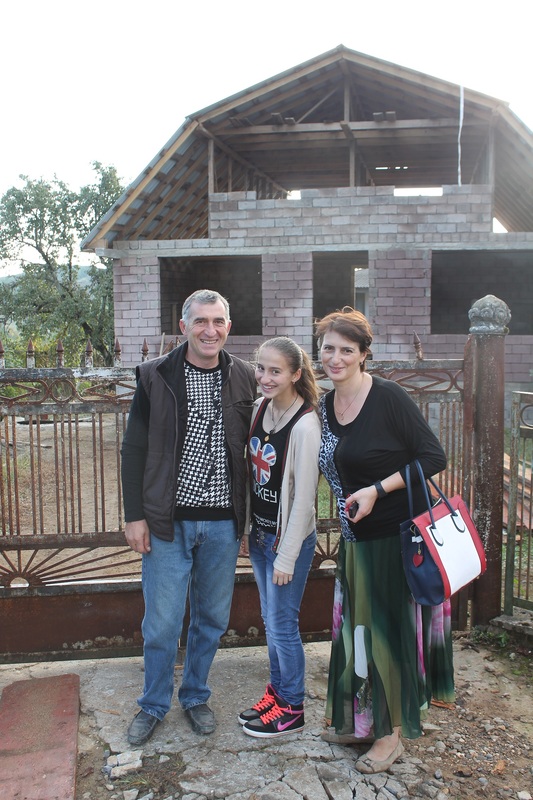 Oleg set me up with a family in Odishi, a village about 15 minutes’ drive outside the regional capital, Zugdidi. 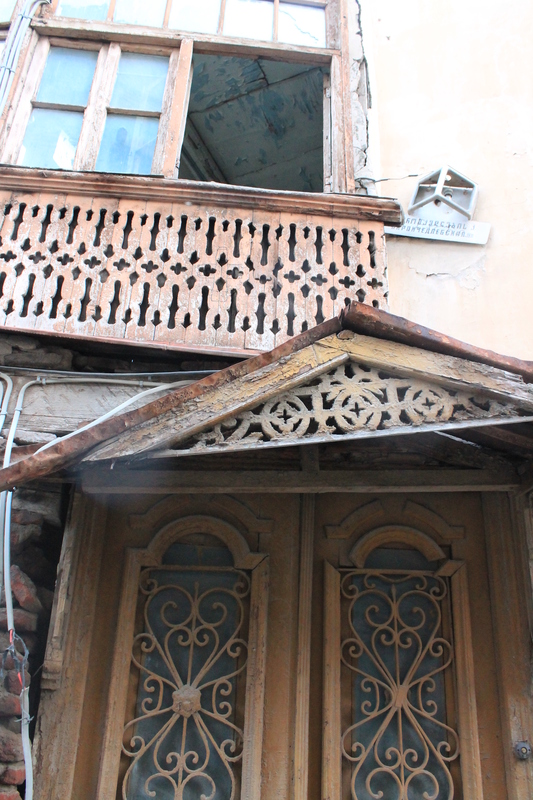 Sixteen-year-old Tako Qobalia and her father Beso met me at the train station at 6:30 am, when the stuffy, lumbering overnight train from Tbilisi arrives. 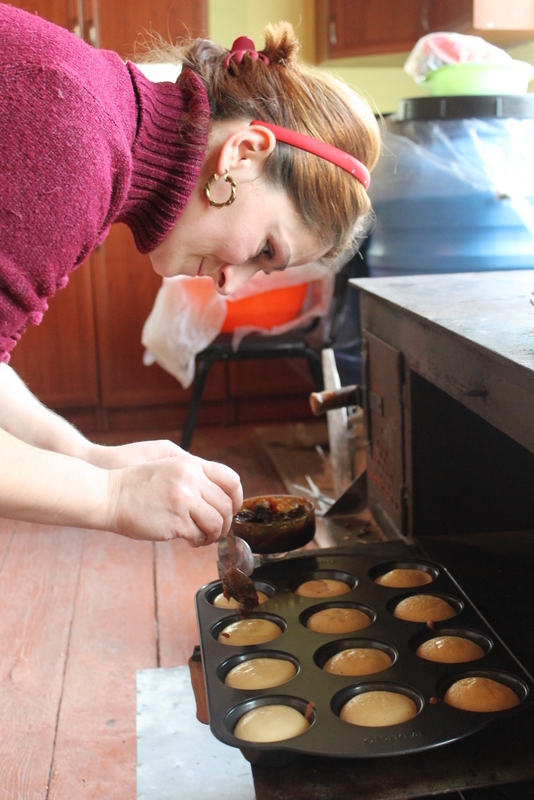 The Qobalias have been hosting teachers from English-speaking countries in their home almost continuously since 2010, when the Teach and Learn with Georgia program began. (This is the same Georgian government-sponsored program that brought me to Georgia for the first time, as an English teacher in a public school in Batumi on the Black Sea coast.) As a result, their daughter Tako speaks fluent colloquial English, peppered with her own sly observations and quick wit. The Qobalias live in the home that Beso’s grandfather built around 100 years ago, though hired laborers are at work on a new one they’ve commissioned a few yards away. Outside they keep a small orchard of hazelnut, walnut, and fruit trees, a kitchen garden, and a screened-in box on stilts where they dry their own apples and figs in the sun. Their calf is still too young to milk, but she makes herself heard with a well-timed moo whenever the herd of small dogs that carouse around the yard are getting overly riled up in their competition for the affections of Sausage, the family dachshund. Tako’s mother, Arleta, is ethnically Megrelian but grew up in Abkhazia, the northwestern-most region of Georgia (at least officially). A devastating war between Abkhazian separatists (with Russian support) and Georgian troops in 1992-1993 forced more than 250,000 people to flee their homes. Arleta and her family were among them. Now the place exists for her in memory and in the foods she grew up with. She starts our lesson by taking two pepper mixes out of the fridge, both called ajika. One is a powdery rub made with dried chili peppers, the other a fiery red paste made with fresh chilis, herbs, garlic and plenty of salt. This paste was what they used in Abkhazia, she tells me. Just smelling it wakes me up. I taste a bit for heat: it makes my lips burn on contact and draws blood to my face, the way a good chili paste should. We begin with ajika chicken. 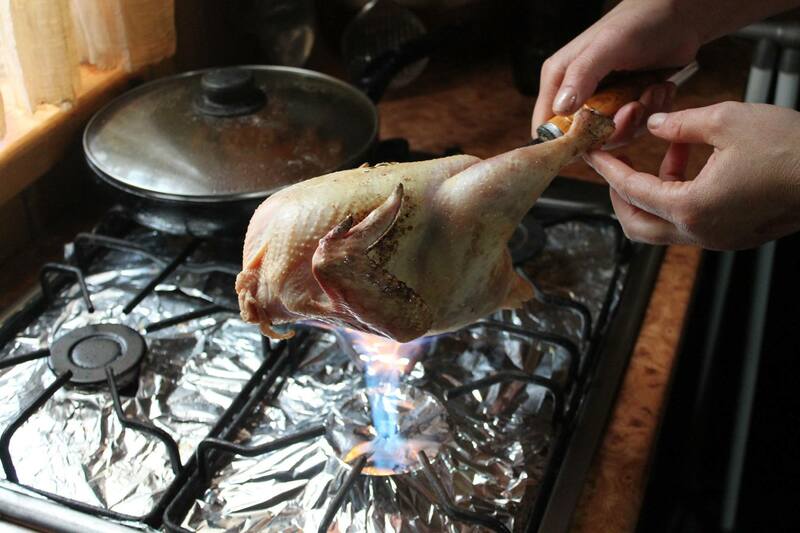 Arleta stabs a hen carcass with a long fork and holds it directly over the gas flame of her stove to sear off the remaining feathers, then butterflies the chicken to make it lay flat in the pan, smears ajika and salt all over the bird’s skin, and pops it into the oven half of her wood-burning stove to roast. 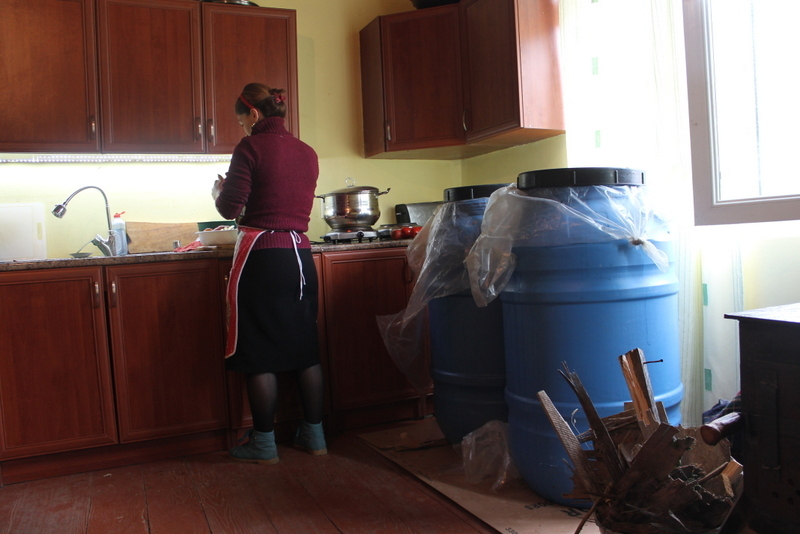 As in many Georgian village homes, the wood stove heats the kitchen and living room area throughout the winter (and is often the only source of heat in the house). As Arleta cooks, she continuously tosses new logs into the fire (contained in a box on the left side of the stove) to keep it hot. The oven half is on the right side. Any food cooked there must be turned halfway through to ensure even cooking. The flat top of the stove is used like a modern cooktop, though the cook can only turn down the heat by moving a pan from the side directly over the firebox to the other. Next we move on to ghomi, the Georgian polenta, which is a staple throughout much of western Georgia. 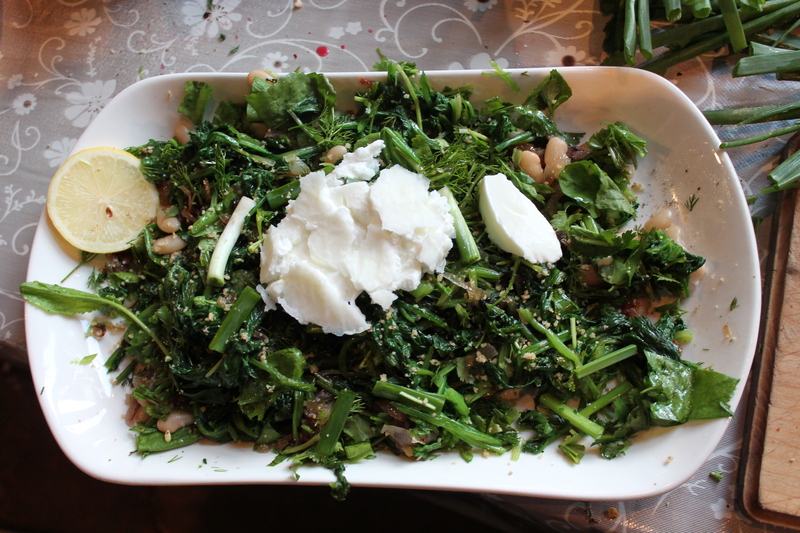 (This dish is called “ghumu” in Megrelian, and in both languages the “gh” is pronounced a lot like a French “r”). Historically, people in western Georgia relied on ghomi and other corn-based dishes as their go-to carbs, while people in the eastern part of the country ate bread. Arleta takes her own dried corn to the local mill to be ground. She sifts the ground meal through a fine-mesh sieve at home, reserving the finest meal and rinsing the coarser grits ten times to remove any hulls and debris. She pours the grits into a pot of boiling water and lets them heat and thicken while we move on to other dishes. When the water boils, she’ll add some of the fine meal to bind the grits. Just before we eat, she’ll pile a hummock of ghomi onto a small plate for each person at the table, then stick a thick slice of smoked sulguni cheese into the center of each. If you melt cheese directly into the grits, you’ve got elarji, which tastes good with just about everything. 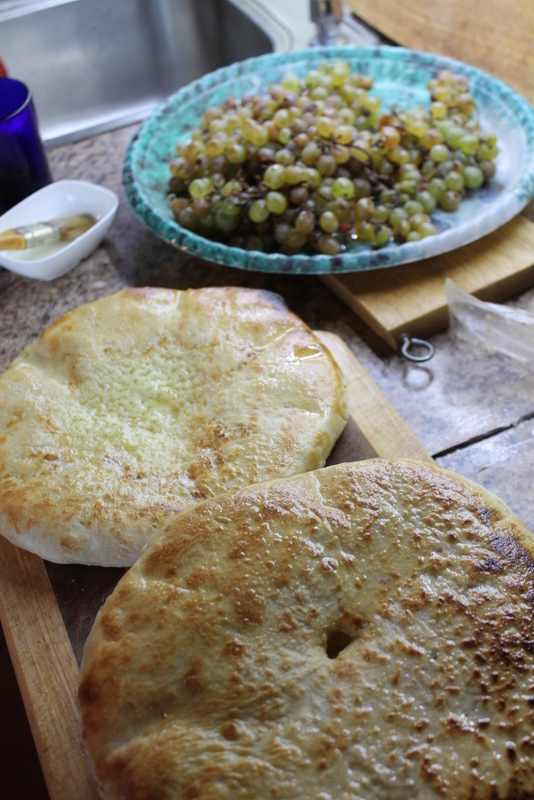 Continuing on with the cheese and carbs theme that runs through Georgian cuisine like a backbone, we prepare the dough for Megrelian khachapuri. 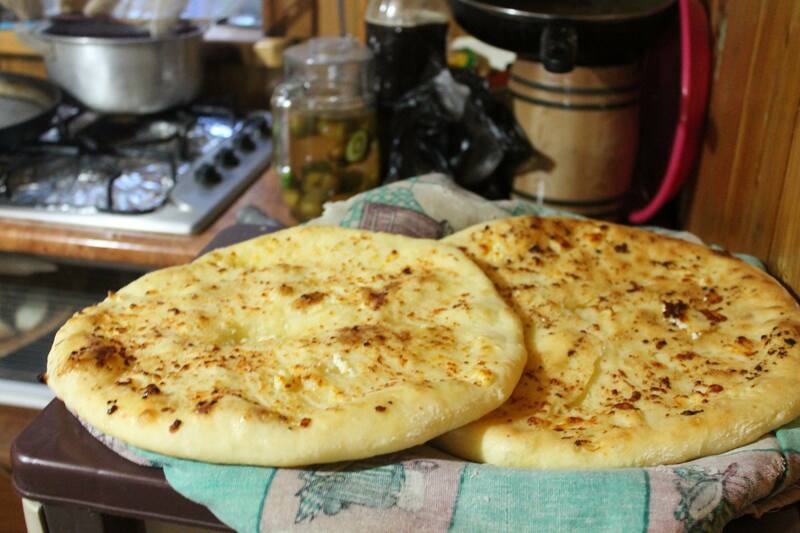 (Its contents are self-evident in the name: khacho is one Georgian word for fresh cheese, while puri means bread.) 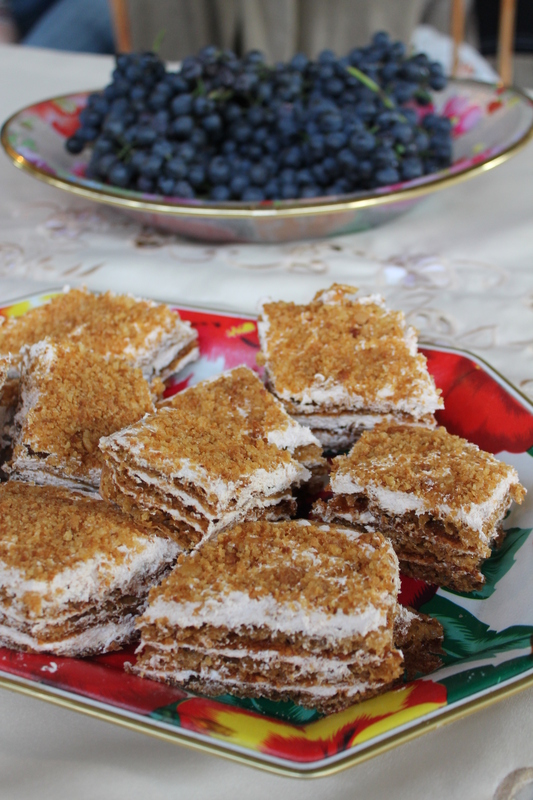 Megrelians typically make this pan-Georgian favorite with an extra layer of cheese mixed with egg and butter or oil slathered on top of the basic cheese-stuffed pie. Judging by Arleta’s practiced movements as she cooks and the easy transitions she makes between several dishes in various stages of completion, I get the sense that cooking 4-5 different dishes in one afternoon is nothing new for her. She says she spends half the day cooking, on average. She’s also the director of the pre-school up the road. As I’m pondering how she manages to fit it all in, she plops a plate of sticky black figs in front of me. “From our garden,” she says. “They dried in the sun.” I’m beginning to understand that here, nature is still very much a partner in labor for most people living outside of major cities. While the khachapuri dough is rising (and the chicken roasting and the grits bubbling…feel like you’re in a nursery rhyme yet? 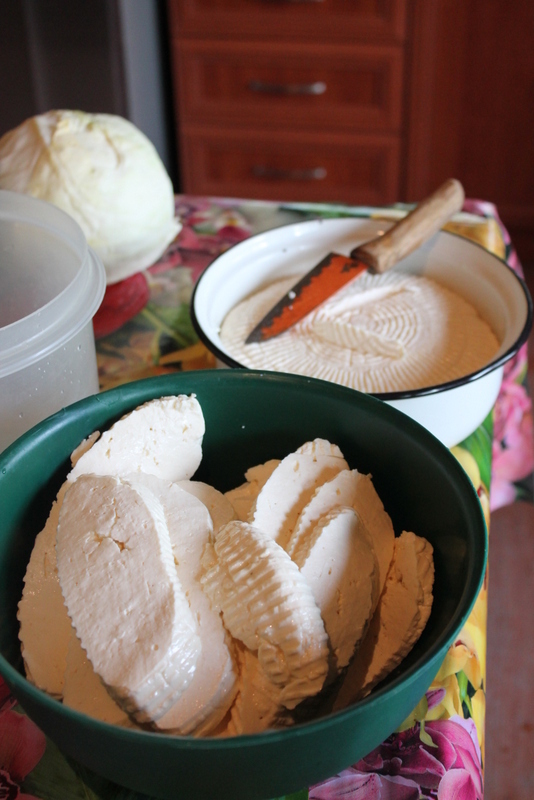 ), Arleta gathers the ingredients for another Megrelian specialty, gebzhalia. 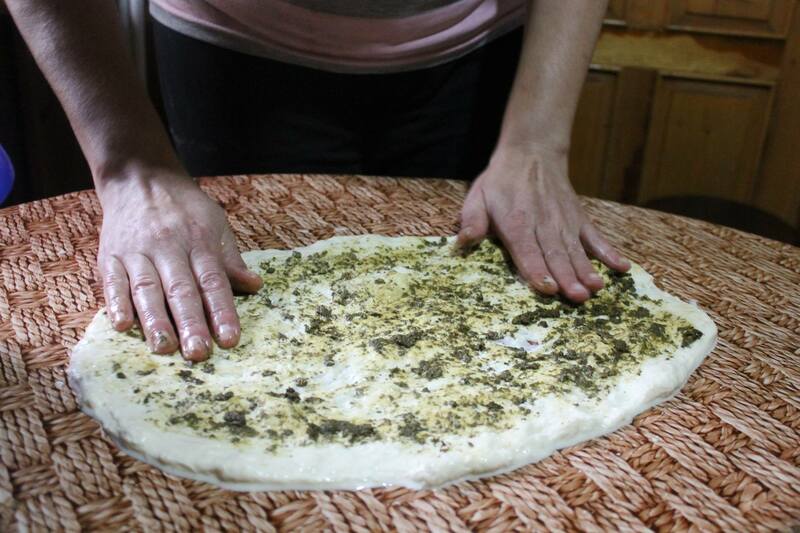 She presses freshly made sulguni (lightly salted cow’s milk cheese) into a flat rectangle, spreads it with a mild green chili and mint ajika, and rolls it up like a jelly roll. She cuts the roll into bite-size slices and covers them with a garlicky mint-yogurt sauce. I’ve rarely seen this dish on Georgian restaurant menus, but I’d certainly put it on mine if I ran one. It’s time to think about dessert. Arleta pours a couple liters of grape juice (pressed from her own grapes, of course) into a pot on the stove, adds sugar and corn flour, and brings it to a boil, stirring constantly as it thickens to a pudding-like texture. Once the flour taste has cooked out, she pours it into flat dishes to cool. This is pelamushi, which is as fun to say as it is to eat. 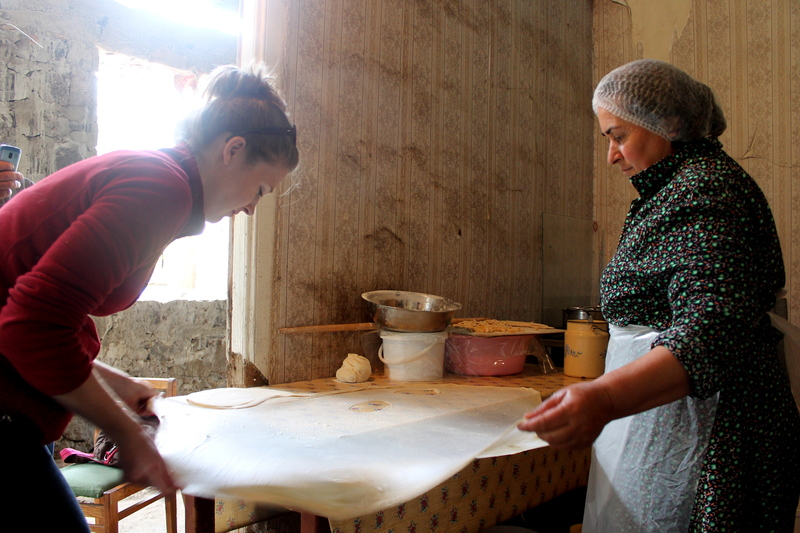 (It’s also known as tatara in parts of eastern Georgia, where it is made with wheat flour). With just about every inch of the table covered with something edible, we sit down to lunch: all this for just Arleta, Tako, and I. 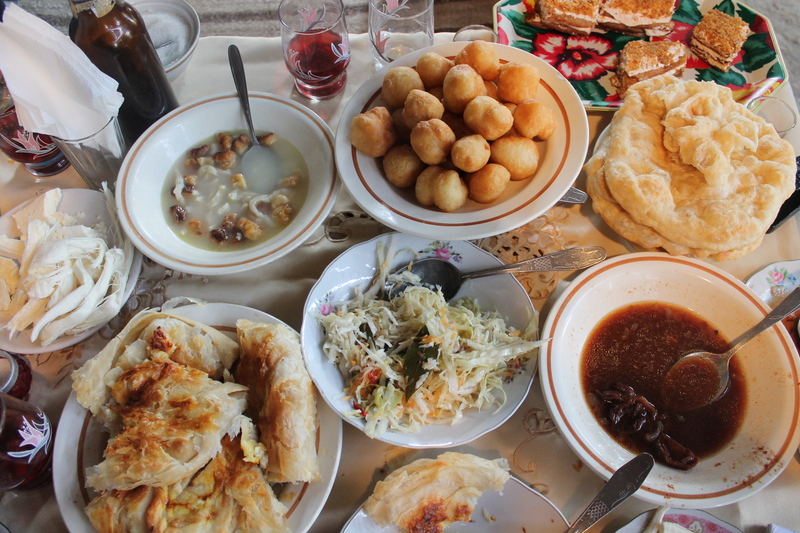 There is far more food here than the three of us could eat in three days, but that’s the Georgian way: variety and abundance are the hallmarks of hospitality. It will all appear again on the table over the next several meals, though seven new dishes will be added tomorrow (including two corn dishes, two meat dishes, another type of khachapuri, and two desserts). It will feed not only the family, but also the American teacher couple the Qobalias are hosting this year, the workers who are building their new home next door, and other friends and relatives who may stop by or stay the night. Bones go to the dogs, some vegetable scraps to the cow, used napkins feed the fire. We end the day with a surprise midnight birthday celebration for one of the American teachers. Tako pops a balloon filled with confetti she’s made herself, Beso is standing by wine and shots of chacha (Georgian grappa), and Arleta has made a poofy layer cake with two different fillings, a third type of frosting, and more sweetened condensed milk than I care to remember. I’ve come down with a bad cold and should probably be sleeping. The teachers have to be at school early the next morning and should probably be sleeping. Yet we all sit in the kitchen with confetti in our hair, toasting to lofty ideals I can’t remember and giving ourselves a drunken bedtime sugar rush. It feels irresponsible and for that, all the more festive. I’m generally wary of national stereotypes, but there is one about Georgians that I do support: let it never be said that this is a people who do not know how to party. Note; Recipes for many of these dishes, adapted for urban kitchens, are forthcoming after I’ve had a chance to test and measure them with American ingredients back home.